ELETTRA from Ronin Films on Vimeo. Encouraged by her friendship with Australian broadcaster, Ben Starr, the Princess opens her home and her heart to recall and relive her family’s saga. Her own story is counter-pointed by her memories of her father and all he achieved. As a girl, Elettra watched her father create magic. For her, the use of radio technology to save the?lives of the Titanic survivors and to track down criminals was just part of her father’s wizardry. He had started a revolution. Wireless became the most fabulous invention of the 19th century: the public thought it was miraculous, and leading scientists of the day could not understand how it worked. 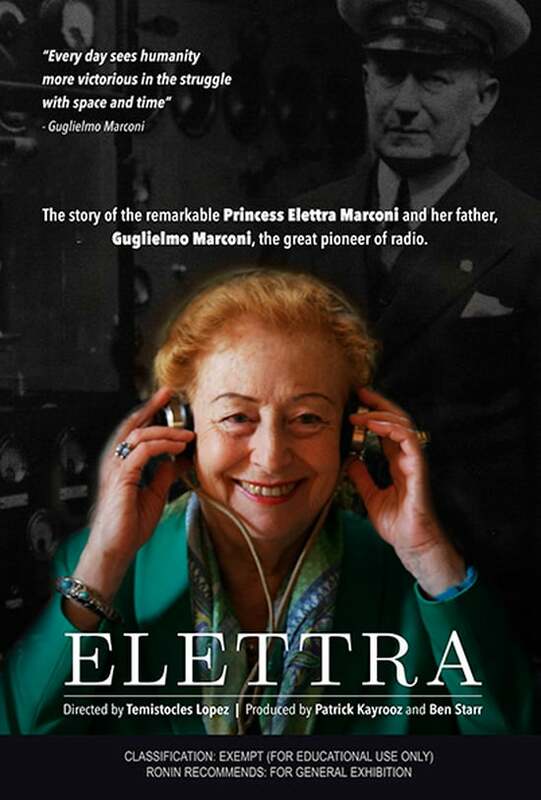 Elettra inherited the Marconi empire when she was seven years old. Having spent her life travelling the world to promote her father’s legacy, the Princess now plans to turn her crumbling family palace in Bologna into a radiant academy for the arts and science. From the gardens of enchanted villas, to the corridors of the Vatican, we peek into the cracks of a new “Dolce Vita”, where nothing is quite what it seems. For all her joyful enthusiasm, the Princess has found little support for her plan in Italy’s dysfunctional ministries and is searching far beyond. Can she make her dream come true? Click here to view the trailer on Vimeo. This entry was posted in News, Nostalgia, Radio History and tagged Documentaries, Elettra, Elettra Marconi, Guglielmo Marconi, Radio Documentaries, William Lee on August 11, 2017 by Thomas.